Research by University of Maryland alumna Kirsten "Kisi" Bohn (Biology Ph.D. 2005) is the subject of “When the bat sings,” the cover story of the June 20, 2014 issue of Science. The story follows Bohn as she studies the songs of bats roosting in ruins in Uxmal, Mexico. The songs are more complex than bats’ more simple high-frequency chirps that are used in echolocation or social calls. These sounds are more complex and rhythmic, like those sung by birds, whales… and humans. Bohn seeks to understand the social and environmental conditions that explain why bats sing—a mentally demanding behavior that few mammals attempt. Studies by Bohn and others have found that like birds, bats that sing tend to be male, live in societies where males mate with more than one female and sing during mating season to court females and defend territories. The hope is that the bat studies can help explain the evolution of complex vocal abilities overall, including eventually human speech. At Maryland, Bohn was co-advised by Professor Cynthia Moss (Psychology/ISR) and Professor Gerald Wilkinson (Biology). 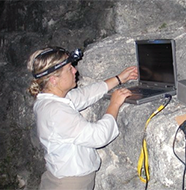 Currently she is a research assistant professor at Florida International University in Miami, where her Bat Communication Lab focuses on the evolution of vocal complexity by studying the vocalizations of several different species of molossidae free-tailed bats.